The Icefields Parkway has been described as the most beautiful mountain road in the world. You will be bicycle touring through Jasper and Banff National Parks while the majestic Canadian Rocky Mountains surround you. For most of the route expect to be cycling along the wide paved shoulders of the highway. Also expect to encounter elk, moose, and big horn sheep right along the highway and there was also a black bear along the road during our visit. VIA Rail or there are private shuttles available from Calgary, Edmonton and Banff to Jasper to get you to the start. You may wish to spend some time in the Jasper area before your journey starts. It is best to ride from north to south (from Jasper to Banff) as you will find the grade of the climbs better and more important you will be riding towards the most spectacular scenery. How far you cycle each day will depend on your preferred type of accommodation (camping, lodges, hostels) and how often you stop to view waterfalls, glaciers, mountains or take short hikes as we did. Starting from the town of Jasper head south along the Icefields Parkway (Highway 93) which is fairly flat in this section. About 7 km from Jasper you can choose to continue along that route or take Highway 93A is a narrower, a bit bumpy and quieter route with some rolling hills before it rejoins the main route. This road also leads to Mt. Edith Cavell and Angel Glacier although trails were still closed during our late June visit due to icy conditions. Whichever route you take brings you to Athabasca Falls located 30 km south of Jasper. Here the waters of the Athabasca River drop through a narrow canyon. Enjoy your lunch at the picnic area while watching the spectacle. There is also a hostel across the road. 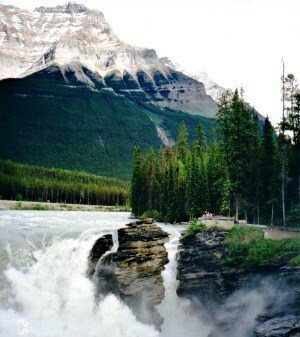 However most cyclists continue to Sunwapta Falls located about 55 km (35 miles) from Jasper where there is a resort and nearby Honeymoon Lake campground. At the falls themselves you will see the water tumble into a limestone gorge. This is the hardest section as just past Stanley Falls the highway climbs 300 meters (1,000 feet) from the floor of the Sunwapta Valley reaching a 12 percent grade at the end before descending down to the Columbia Icefield, located 103 km south of Jasper. Here you will find several campgrounds, a hotel, and restaurant. The Columbia Icefield is the largest in the Rocky Mountain covering 325 square km (125 square miles) with the water flowing into three oceans. We went for a quick walk on the section of the glacier near the highway but with are also snowmobile tours available. Riding from the Icefield Centre at 109 km (68 miles) from Jasper you continue to ascent to 2,035 meters (6,676 feet) and the park boundary between Jasper and Banff National Parks with the Hilda Creek Hostel just past this. About 143 km (89 miles) into your journey you descend approximately 300 meters (980 feet) over a 11 km (7 miles) stretch down the “Big Hill” providing you with spectacular views of the mountains and valley below. 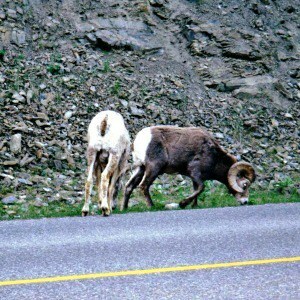 On our trip there were also some Big Horn Sheep along the side of the road. Continue along to the 154 km (96 miles) point and junction with the David Thompson Highway where you can find accommodation, a restaurant and store to stock up on items and where you also cross the North Saskatchewan River. 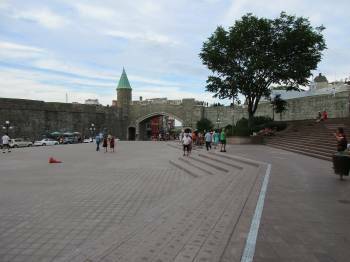 David Thompson was a fur trader who first came through this area in 1807. 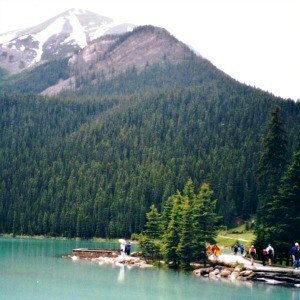 You will be climbing a bit past Mistaya Canyon and to the Waterfowl Lakes Campground, some 174 km (108 miles) from Jasper. The Icefields Highway continues to climb to the summit of Bow Pass, at 2,069 meters (6,787 feet) the highest point offering some great views. Over the next 40 km (25 miles) however you will be gradually descending. There is a hostel, campground, lodge along this section. You must take the opportunity to hike or bike to Peyto Lake, known for its picturesque emerald waters. After 231 km (144 miles) of riding you reach the junction with the Trans Canada Highway and follow it for a short distance into the resort town of Lake Louise. Campgrounds, hotels, shops, restaurants are available and it is worth stopping for a few nights. Joining many others we followed one of the hiking trails into the mountains to the famous Tea House for outstanding views of the mountains. Cycle up to Moraine Lake in the Valley of the Ten Peaks (considered by many to be even more beautiful. Leaving Lake Louise for the final 64 km (40 miles) you are no longer on the Icefields Parkway but instead following the Trans Canada Highway for a short distance before joining the much quieter Bow Valley Parkway as it follows the Bow River. During our visit numerous Elk could be found grazing along the side of this road. At Johnston Canyon we stopped beside the hotel for some ice cream and to follow the numerous tourists to view both the Upper and Lower Falls. We lost the crowds as we continued along the same trail to the Ink Pots, which are pools of blue-green water. This hike is 5.8 km one way, a 4 hour return walk. After 290 km (180 miles) we pulled into the town of Banff where Elk stood next to the welcome sign, although not arranged by the tourist office these wild animals provided a suitable welcome. Banff boasts numerous hotels, shops and restaurants. The park office provides a map of local cycling routes for both mountain and road bikes. My brother met us in town and drove us along the 24 km scenic Lake Minnewanka Road which is rated moderate for cyclists. We also took a walk in Banff to see the Bow River Falls and Hoodoos, unusal rock formations. Supplies: Stock up on supplies in advance as they are very limited along the route. Other interesting Canadian bicycle routes. If you are looking for an incredible bicycle touring trip along mountain-lined route the Icefields Park is an excellent choice.